You followed a tutorial to create a simple table view, you managed to create a custom cell with some labels and images, it seems to go well. But as soon as you scroll it, you noticed something is wrong. 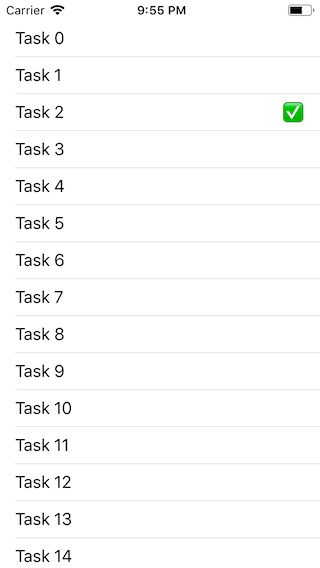 The above example shows a tableview with a to-do task list. 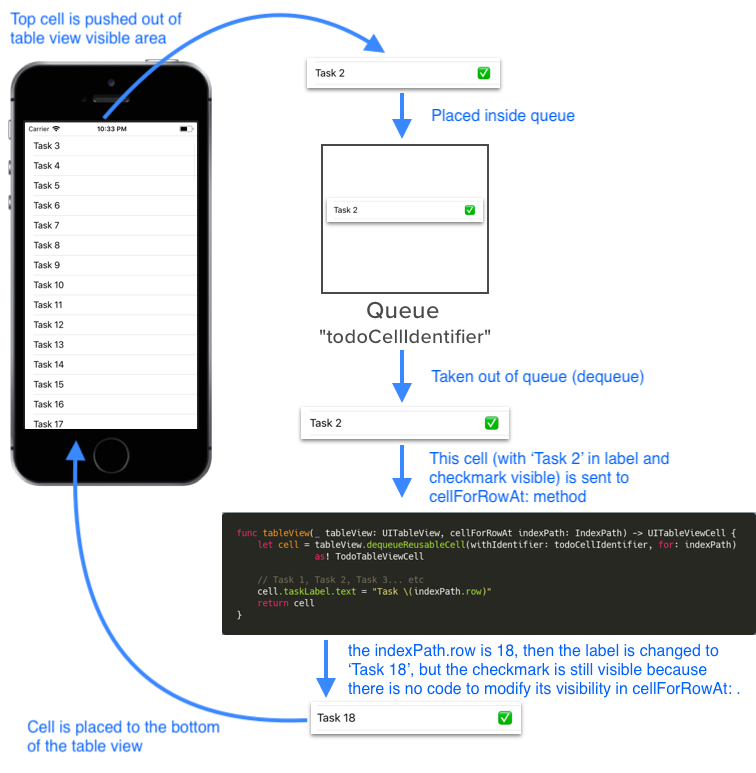 When a user tap on the cell, it means the task has been done and a checkmark will be shown. But as user scrolls after tapping a few cells on top, the cells below are also marked as done even though the user didn't tap them before! Why does this happen? Remember the dequeueReusableCell(withIdentifier: for:) method you used inside the cellForRowAtIndexPath method? 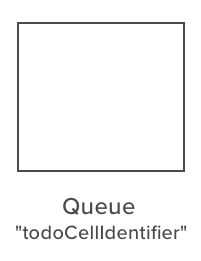 This will create a queue named todoCellIdentifier, this queue is used to hold multiple cells of class TodoTableViewCell. 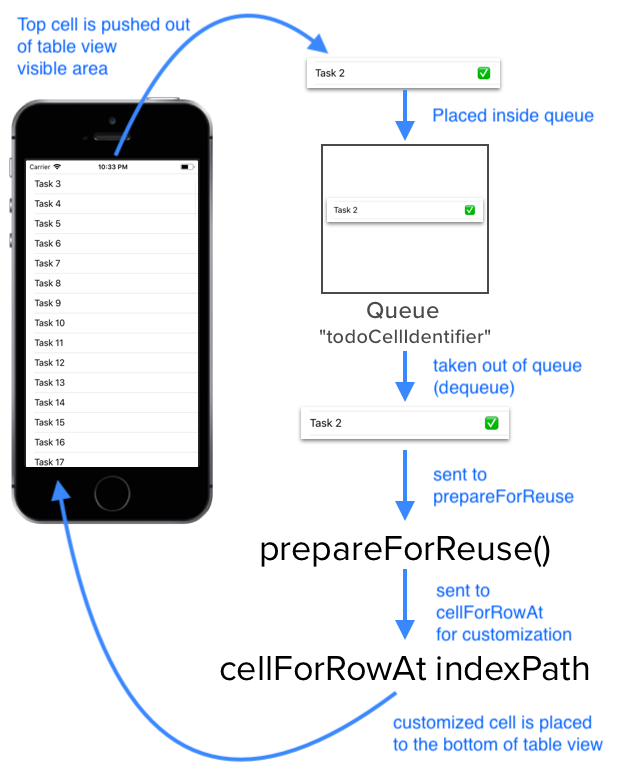 iOS uses a reusable cell queue mechanism to optimize memory usage. 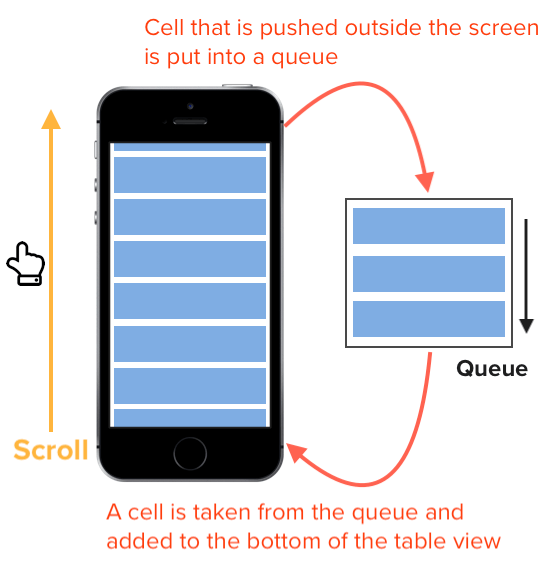 Say your tableview has 1000 cells, instead of putting all 1000 cells in memory, a queue is used to store just enough cells to display on the screen (plus a few more cells as buffer), when a new cell is about to appear on screen (due to scrolling), a cell will be taken out of the queue, customized in cellForRowAtIndexPath method, and then inserted to the tableview. When user scrolls down, the top cell that is pushed outside the screen is placed into the top of the queue, and the bottom cell in the queue is taken out and placed to the bottom of the table view in the screen. Notice that we didn't reset the visibility of the checkmark in the cellForRowAt method, and cell 18 is actually cell 2 being reused. As we tapped cell 2 before (making its checkmark visible), this property is passed down to cell 18! Note: Apple's documentation recommend not to reset content-related attribute such label.text in prepareForReuse due to performance reasons. For performance reasons, you should only reset attributes of the cell that are not related to content, for example, alpha, editing, and selection state. The table view' s delegate in tableView(_:cellForRowAt:) should always reset all content when reusing a cell. Edit: Thanks Leonardo for mentioning about this! Most of the duplicated / repeated cell issues happen because we didn't reset the cell UI elements to hidden / blank state before reusing it in the table view. This can be solved by resetting the UI elements data in the prepareForReuse function in the custom cell class 🙌.